Spanish canon and inquisitor; called by certain Jews "the creature and darling of Torquemada"; born about 1441 at Epila, Aragon (hence sometimes styled "master of Epila"); died Sept. 17, 1485. He was appointed canon of Saragossa in 1474; and ten years later Torquemada appointed him and the Dominican Gaspar Juglar inquisitors for the province of Aragon. The zeal exhibited by Torquemada in his religious persecutions was emulated by Arbues, who in the first month of his office held two autos da fé, at which several Maranos were executed, and others were condemned to penance and loss of property. Though no record of further trials exists, he must have continued to be active in persecution, as the Maranos were so enraged that his assassination was determined upon. The offer of enormous sums to Ferdinand and Isabella to induce them to limit the activity of the Inquisition and the confiscation of property had been fruitless, and, after consultation with newly converted Jews—some of whom were men of high rank, like Gabriel Sanchez, the king's treasurer —the extreme step was taken by two wealthy Maranos, Juan de la Abadia and Juan Esperandeu, with the hired help of an assassin, the latter's French servant, Vidal, probably a Jew. Abadia's incentive was doubtless the execution of his sister and the condemnation of his father by the Inquisition. An attempt to enter Arbues' bedchamber failed; but the design was accomplished while he was attending mass. Two days later he died from his wounds. The retaliation on the Maranos, not all of whom were implicated, was awful. Vidal and Esperandeu were cruelly put to death; and Abadia made an attempt at suicide while awaiting his auto da fé. On Arbues' death, popular belief invested him with miraculous power. A Jewess saved herself from death by proving that from Catholic zeal she had dipped her handkerchief in his blood. His canonization by Pius IX. 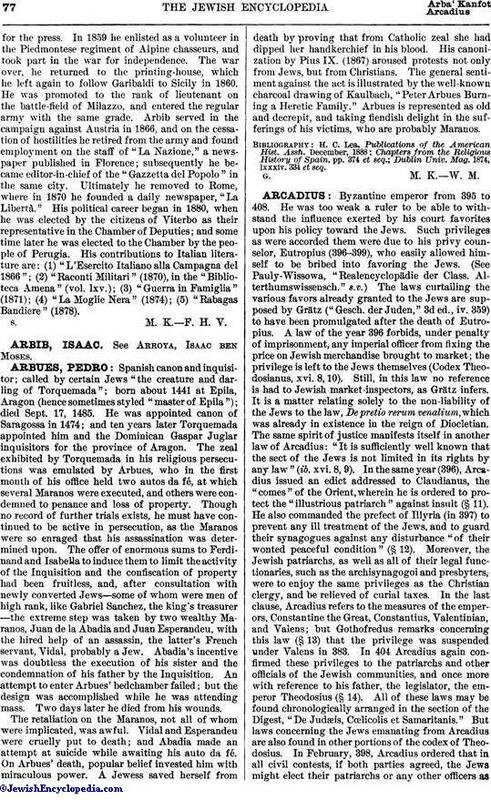 (1867) aroused protests not only from Jews, but from Christians. The general sentiment against the act is illustrated by the well-known charcoal drawing of Kaulbach, "Peter Arbues Burning a Heretic Family." Arbues is represented as old and decrepit, and taking fiendish delight in the sufferings of his victims, who are probably Maranos. Dublin Univ. Mag. 1874, lxxxiv. 334 et seq.